In 2008, 13.2 percent of US residents, and 16.3 percent of residents in rural counties, had incomes below the poverty line, which was $22,025 for a family of four. 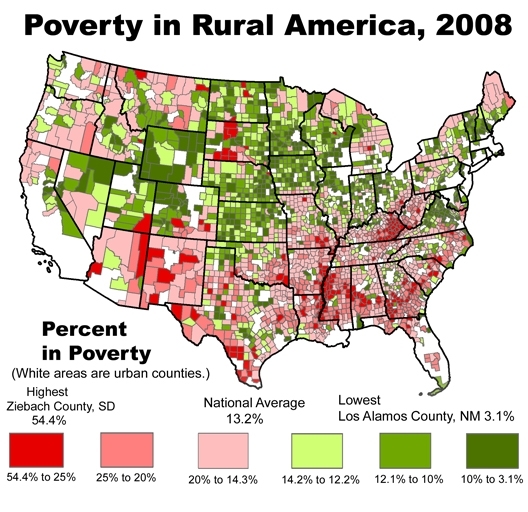 Poverty rose faster in rural than urban areas between 2003 and 2008. Rural counties have a sixth of US residents but accounted for a third of the three-million increase in poor US residents between 2003 and 2008. Most labor-intensive agriculture in the western states and Florida is in urban counties.